Members of the faculty and administrative personnel of the Western Mindanao State University (WMSU) came together to celebrate the university’s Family and Faculty Union Day. 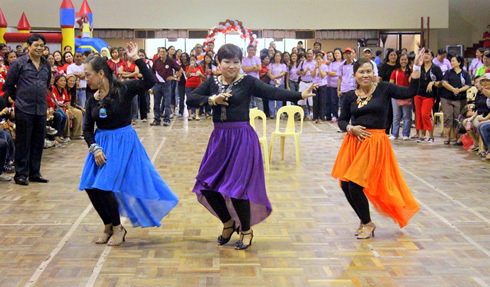 The fun-filled get-together was held last September 17 at the Dr. Juanito Bruno Gymnasium. The event is in consonance with the university’s banner, Un Universidad, Un Familia, Un Amor, in which different members of the faculty of each colleges and the WMSU Administrative Personnel Association took the opportunity for recreation and to foster friendship among the WMSU community as well. Newly elected Faculty Union President and Faculty Regent-Prof. Edgar R. Araojo gave the words of welcome during the event. While WMSU President-Dr. Milabel Enriquez-Ho rendered words of motivation to the two equally important assets of the university-the faculty and the administrative personnel. Some of the activities during the Family Day were dance competition, Doble Kara, dart, volleyball game, chess and domino and free bone scanning. A Bingo socials was also held in the afternoon, in which cash prizes were given away to the winners. On the other hand, already on its 11th year, the Faculty Union of the university is commemorating its foundation day. The union was formed sometime in 2001 and is currently composed of 496 members.